How do you put on your underwear? I’ve seen my boys dress themselves. Both boys sit down on the floor, when putting on their underwear and pants. They do not stand. It always humors me when I see them sitting on the floor putting on their underwear and pants. Silly kids, I think to myself. This morning, as I was getting dressed, I stood up and started putting on my underwear. As I lifted one foot and went to place in the leg hole of the underwear, my foot got caught, and I lost my balance. Hmmm. Let’s try this again. Once more, I lifted my foot and carefully aimed for the leg hole of the underwear. Again, my foot got caught and I stumbled. Stupid underwear, I mumble to myself. Thankfully, the third time was the charm, if only because I held on to the sink counter for stability. [Oh hush, you.] Perhaps I should try putting on my underwear and pants while sitting on the floor. 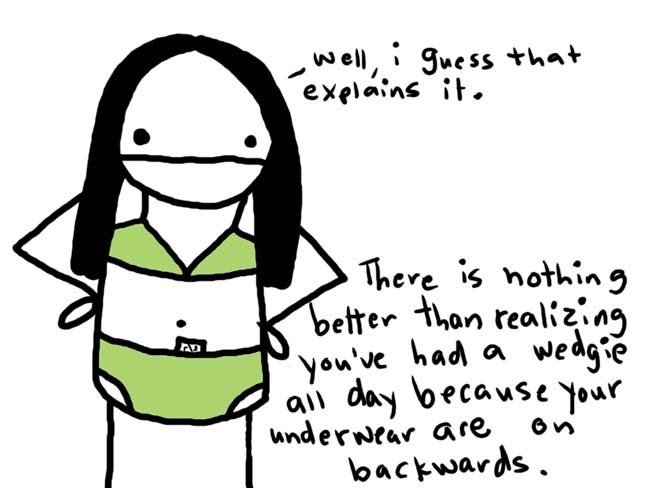 You don’t have any problem maintaining your balance when you put on your underwear? Oh yeah? Well, don’t gloat, or I’ll give you a wedgie. How very sensible of you all!